Photo by Benjamin Funke Paul Rickard's watercolor "Freshwater Gardens." This month, watercolorist Paul Rickard is staging the last of three successive month-long shows at the Trinidad Coastal Land Trust's Simmons Gallery. The first focused on the land trust's properties, while the second presented views from Trinidad. This third exhibition brings together an eclectic assortment of plein-air subjects, all painted on the spot: coastal views from Trinidad and environs, landscapes made in the Loleta highlands, scenes from Sequoia Park and the Humboldt State University campus, as well as Eureka and Arcata street views. The paintings exude an observational zest that makes it easy to believe the ebullient Rickard when he says that each fresh watercolor sheet represents a possibility that can be "intoxicating." Figures populate some of these scenes, assuming more importance than they previously have in the artist's work. Vertically oriented studies of Arcata alleyways depict passersby in addition to the historic buildings on the plaza and the signs on Tavern Row. Last year, Rickard's exploration of local marshes and bottomlands brought him into contact with a number of unhoused people who, prior to last year's evictions, were camping there. When those people showed up as figures in Rickard's landscapes, their presence in the coastal spaces was illegal: They were literally out of place. The plaza strollers, beach picnickers and plein-air painters who appear in these works are in their element, but they are rendered with the same light, matter-of-fact touch. In retirement, Rickard has taken advantage of his freer schedule to devote more of himself to art, often painting as many as 50 hours a week. I asked how his relation to the medium had changed after several years of this practice. "I feel like I'm really understanding, or starting to understand, how to communicate the atmosphere and what I've seen," he replied. "The drawing part comes quickly now. Now I'm picking up more on value and color." 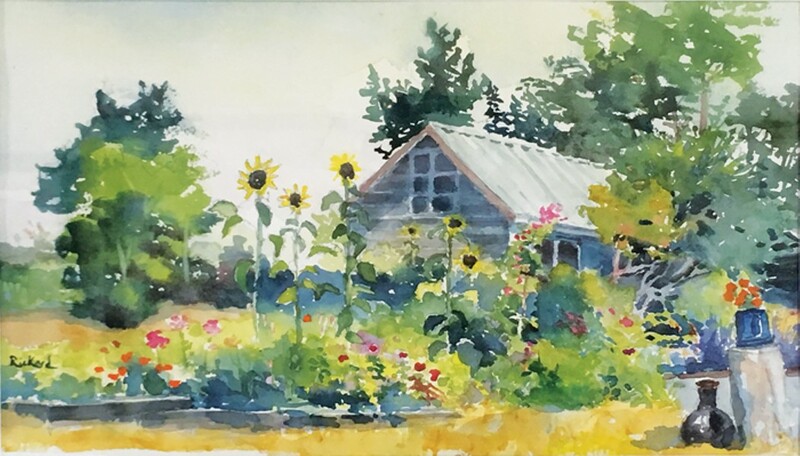 Rickard credits his rapid development as a watercolorist to the mentorship and encouragement he received since beginning to paint full time from senior members of the close-knit Humboldt plein-air painters group, including Jim McVicker and Stock Schlueter. "Painters of the Fog — Moonstone Beach" depicts four of these plein-air enthusiasts together at Moonstone Beach, lightly obscured by glowing wreaths of mist. Like that fog, Rickard's technique is both brilliant and translucent. Process can become quite transparent. It is possible to count individual brushstrokes in many places, if one so chooses. Some of the marks blend smoothly, while others stay reciprocally contained. Take "The Colors of April, Luffenholtz Lookout," for example. At one point during this small study's genesis, the narrow levee of dry white paper that kept an olivaceous green separated from the ochre puddle next door was breached, and colors mingled at the border. Capillary action drew tiny rivulets of the darker wash into the rag paper's cotton fibers, stamping the ochre with a lacy bleeding edge. Materials become visible as an artifact of process here, every bit as strikingly as they may in a non-objective piece. Asked about sources of inspiration, Rickard said that recently he'd been looking at the work of early California landscape painters like Edgar Payne, Percy Gray and Armin Hansen, as well as the Impressionists, naturally. "It's important to look at art. Curtis Otto used to tell me, 'Realism is a trap.' Art is better when you interpret what you see, rather than trying to replicate it. Once you gain skill, you can render things. And then, at some point, you go beyond that." We were speaking on Sunday afternoon, so Rickard was fresh from the latest meeting of his Sunday Paintout group, which meets weekly throughout the year to paint outdoors. "Today I went out to paint the Samoa Bridge with the group," he said. "There were about eight of us out there, looking over at the span of the bridge and into the sun, just as the sun was coming up. "It was challenging, looking directly into the sun. There were whitecaps on the water and the whole bay was sparkling white. In a photograph," the artist mused, "the subject would have been terrible," as the starkness of the contrast would have killed all nuance. "In a photograph, you would have seen nothing but black and white. But I realized that there was actually a lot of color out there. And when you're painting, you might be able to capture some of that. I said, 'This is worth a try.'" Paul Rickard's paintings are on view at the Trinidad Coastal Land Trust's Simmons Gallery (380 Janis Court,Trinidad) Friday through Sunday from noon to 4 p.m. through the month of October.